The art in Wayward Volume One is probably the best part of an otherwise cliché book. The backgrounds are gritty and realistic in a way that feels completely grounded, and the character art is bright and stylized. Unfortunately, all of that beautiful design is in service of story about yet another teenager discovering hidden magical powers and using them to fight monsters. Rori Lane is half-Irish and half-Japanese, which means she speaks the language but has a head of bright red hair that makes her stand out in a Japanese crowd. The story opens when she moves to Japan to live with her mother after a (so far unexplained) falling out with her father. Her mother works long hours and is hardly ever home, but Rori seems to have nowhere else to go, so the arrangement works. There are the occasional interesting details, but they feel more like window-dressing than real characterization. Rori’s mixed heritage means she’ll never really fit in, no matter how well she learns to speak Japanese. The author plays with that theme, but doesn’t dig deeper than a moment where her teacher tells her to dye her hair black so that people won’t think she’s a troublemaker. We also learn that Rori is a secret cutter, but the revelation feels completely arbitrary and gratuitous because it doesn’t have any impact on the story. Ultimately it just feels like a cynical attempt to add depth to the story. The other characters aren’t given much more depth than their magical abilities, but at least Ayane – a magical “cat girl” – is entertaining and strange. The story rushes through Rori discovering her powers and meeting other powered characters so that it can get to the fight scenes. 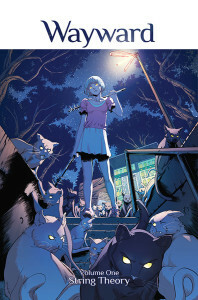 I don’t necessarily prefer stories that dwell on characters discovering a secret world in plain sight, but Rori starts out the book lost in another country and ends up leading a team of magical teenagers in a very short amount of time. Additionally, the dialogue is oftentimes very wooden, reading as if Zub is trying to imitate English poorly translated from Japanese. Ultimately the art and colors are the only things I actually liked about this book. Without the art, you have nothing but a story that relies on well-worn tropes, limited characterization, and dialog that is both wooden and unnecessarily vulgar. I doubt I’ll pick up another volume.